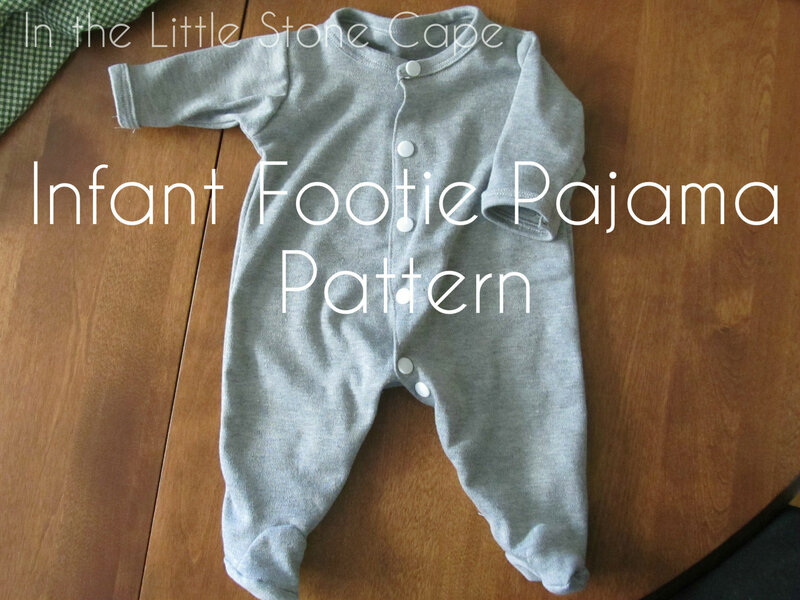 So maybe this was an ambitious project because I looked all over for a commercial infant footie pajama pattern and couldn't find one. Then I searched the web and was still having a hard time coming up with what I really wanted. So I drafted my own pattern. Why, you ask? Well, not just for the fun of it, believe it or not. A few months back I got an idea for an outfit for my soon-to-be-born niece. I wanted a plain pink footie pajama that I could embroider. But every one I found in the stores already had something printed or embroidered on it somewhere. But I'm not the type to back down from a challenge (at least of this sort) so that's when I started my search for a pattern. In the end, I threw my hands in the air, pulled out a pair of 0-3 sized pajamas that I already owned and started drafting. The pictures shown are of the pajamas I made for my new baby due in a a few weeks as part of his Halloween costume. This pattern is for 0-3 months and includes snaps down both legs. Download Pattern Here. I'd call the difficulty level experienced beginner to intermediate. 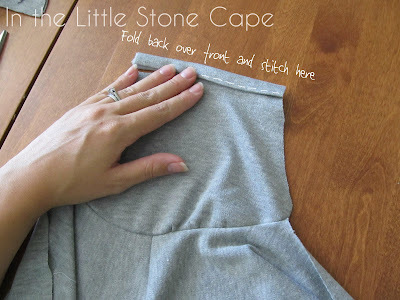 You should be comfortable with knits (using a ball point needle will make all the difference), and know how to ease fabric pieces together (which is fairly easy to do with knits). 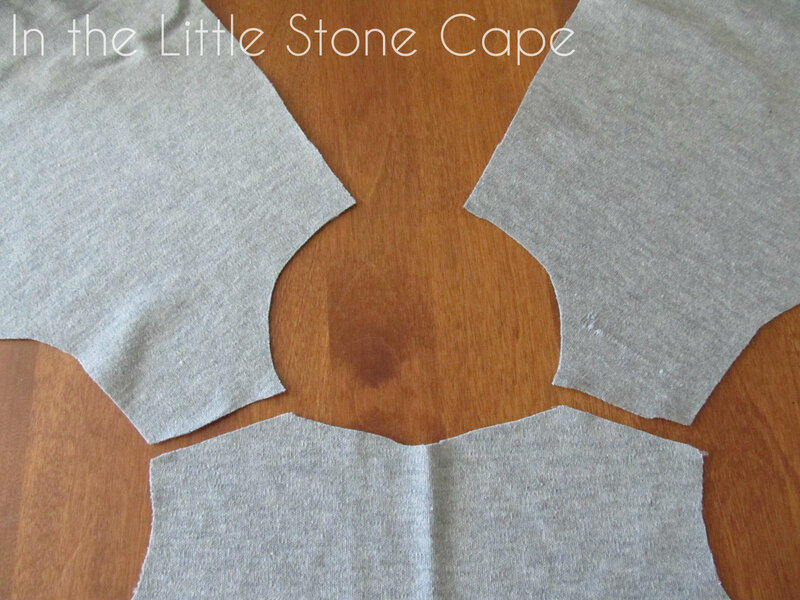 Block out your pattern on the fabric, pin it, and cut it out. Don't forget to make sure you are cutting on the grain (the knit "rows" vertical on the garment). All the seam allowances are already added, they are all 3/8 in. unless noted otherwise on the pattern. 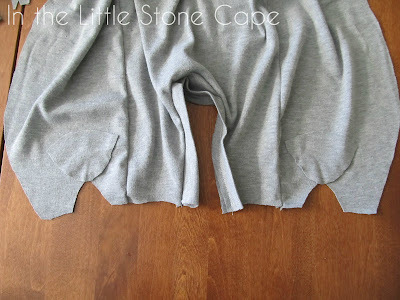 Start by piecing the shoulder seams together. 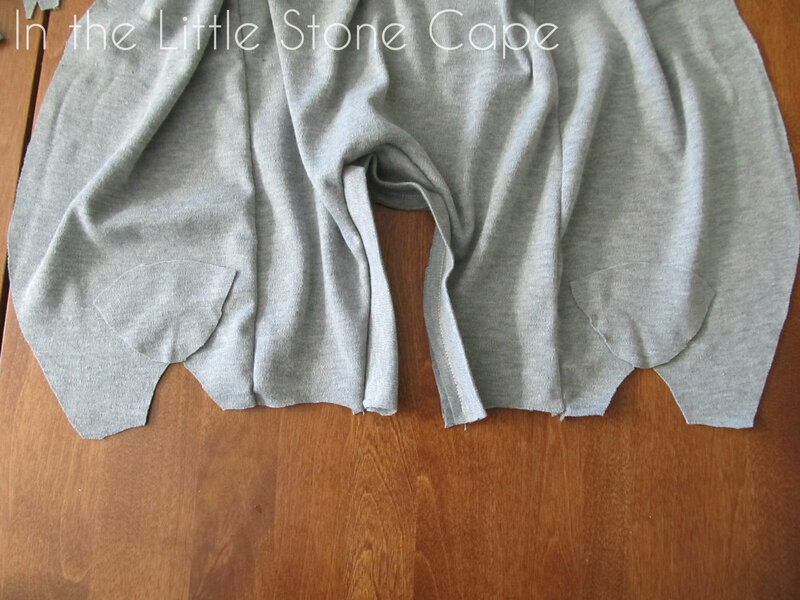 Right sides together, sew each shoulder seam. 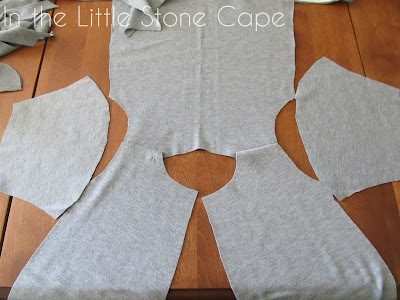 Now piece the sleeves to the shoulders. Line up the darts on the pattern. With right sides together, ease the sleeves on. Failure to ease properly will result in puckering which is particularly obvious on shoulder seems. Now it's time to bind the end of the sleeves. 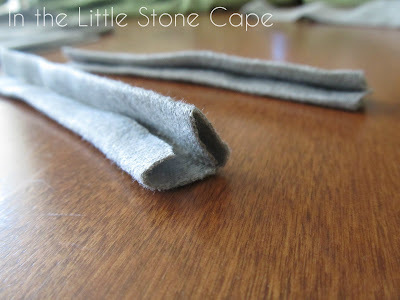 You should have cut one 25 inch long, 2 inch wide fabric piece. Press the whole thing at once, and then you can cut off what you need for the sleeves and neck if you wish. you'll need 5 inches for each sleeve. To press, fold down 1/2 in. 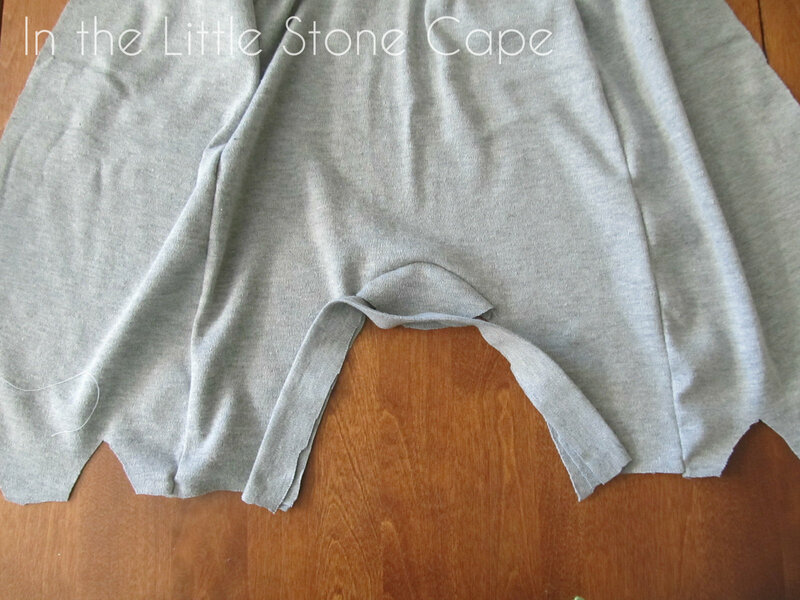 on one side the length of the strip, press, fold down 1/2 in. on the other side, press, the fold the strip in half lengthwise and press again. It will look like the picture below. To attach it to each sleeve, unfold the top half of the strip, match the edge to the of the sleeve with right sides together, pin, and sew along or just above the crease of the binding. 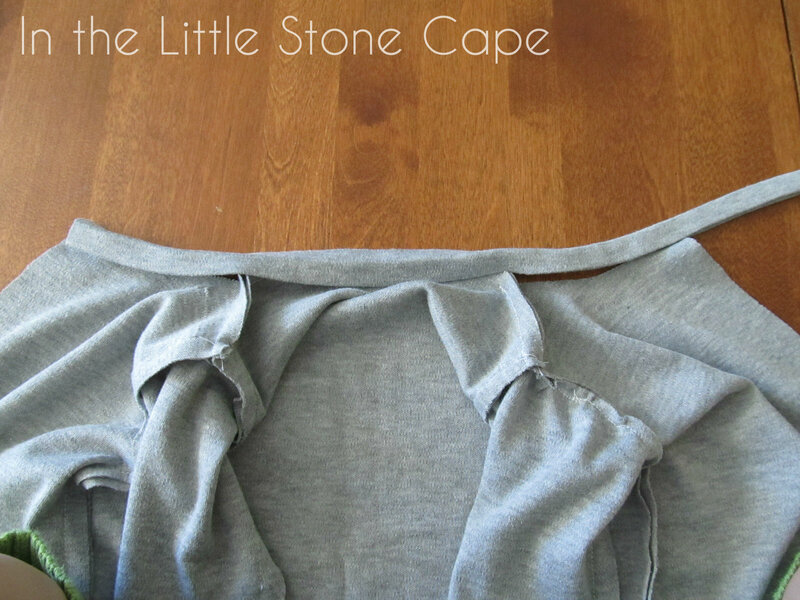 The picture below is not correct, you'll want to unfold the top of the binding and sew inside that crease. I think I was a little hurried when I was taking pictures, but you can see where it goes generally. Once the binding is sewn in place, now you can turn it and refold it so that the binding covers the raw edge of the sleeve on both sides. Sew down on the right side of the garment close to the edge of the binding. You can use a double needle for this if you want, of if you like the look but don't have a double needle handy you can make two rows of stitches. One row is just fine though. Hopefully if everything came together correctly, you'll have sewn down the front and back of the tape, but if you skipped in spots, it's ok since it's on the inside of the sleeve. You can now sew down the side of the garment from the cuff to the foot. There is a little easing here as well. 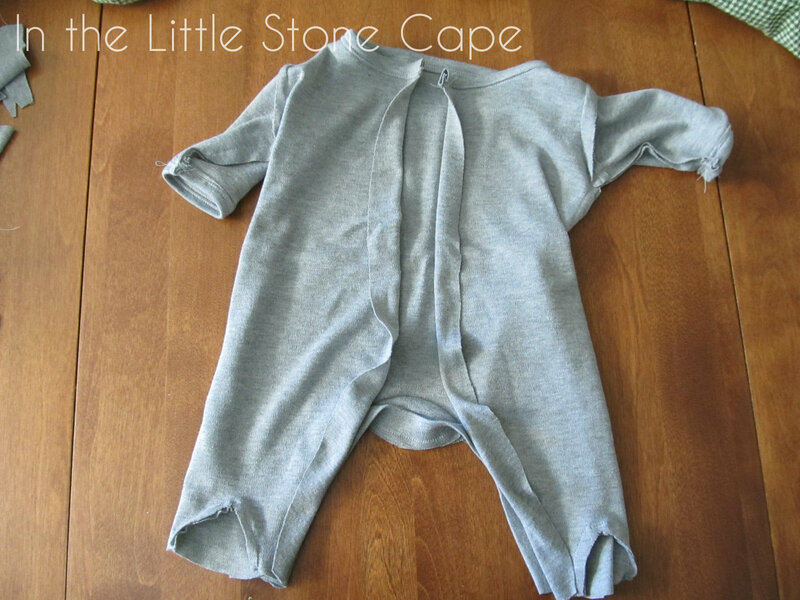 Trim and/or baste down the seam at the wrist so that it doesn't rub baby's skin. Do this on both sides. Now you can use the remaining binding for the neck. Use the same technique as before to sew the binding to the neck. Piece the crotch piece in place in-between the legs. Ease the pieces together. Now press the other 2 inch strip of fabric in half. With right sides together, piece it in place and sew from one foot, to the other. 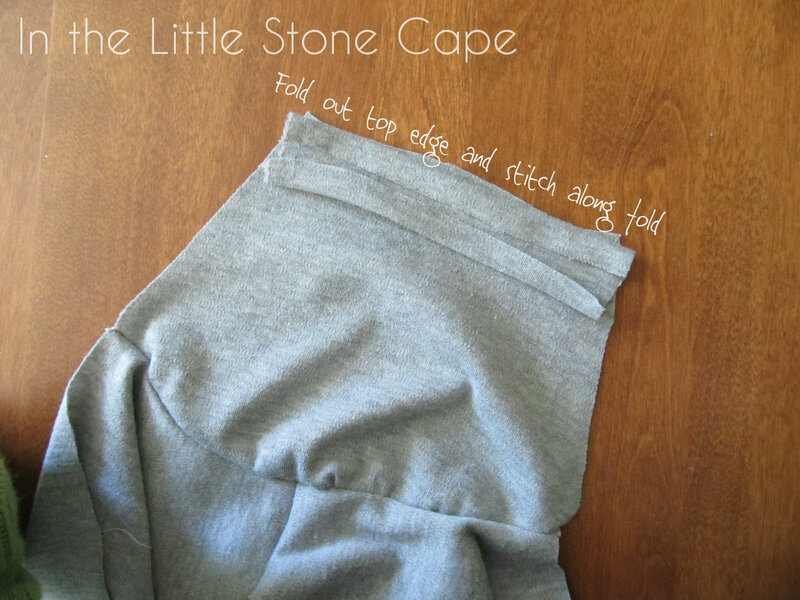 Now with right sides together, ease the toe tips to the bottom of the legs on the front of the garment. Next, press the two front seems down 3/4 in. Sew together the ankles of the legs from "ditch" of the fabric strip to one inch up at an angle. See the picture to understand what I mean. Now it's time for the feet to go in. I know what you're thinking. There must be some mistake, these feet are too big for the opening. Trust me, they'll fit. You'll have to pin them in before you believe me and there is some easing to be done, but in the end you'll have two little footies the perfect size for a new baby. 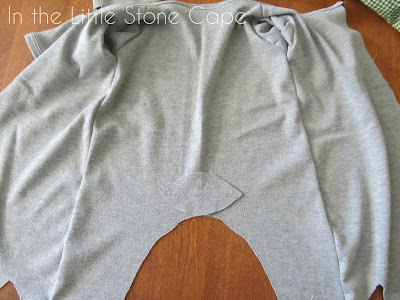 Go ahead and trim the seams so they don't take up too much room where baby's feet will soon be growing. Oooh! Almost done! Now all that is left to sew are the front hems. Pin down the allowances. They are as wide as they are to support the snaps. 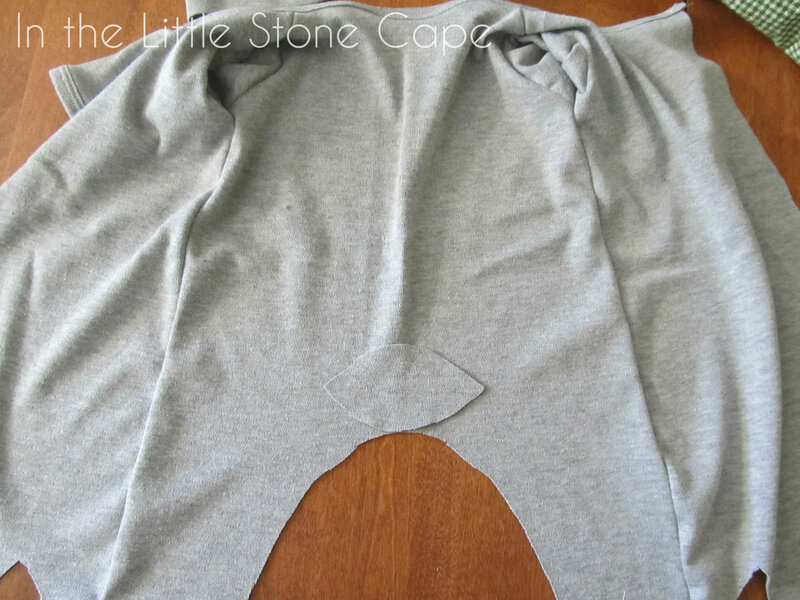 If your fabric is on the flimsy side it would be prudent to also line the allowances with stabilizer. Sew the hems down as close to the edges as you can from the opening above the ankle all the way to the neck. 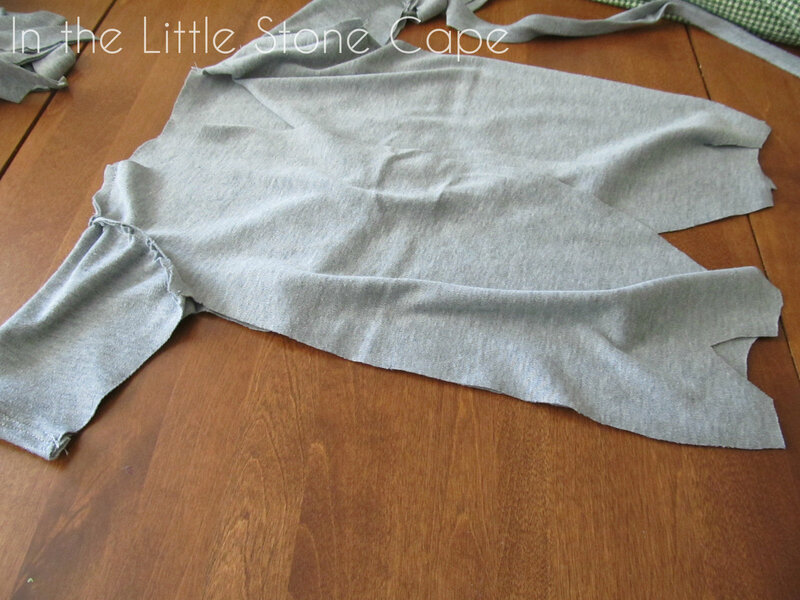 Fold the binding at the neck down a bit so that it doesn't poke up out of the neck opening. That's it for the sewing. Now all that is left is the snaps. Since all snaps are different, I'll refer you to the package directions on the snaps that you purchased. 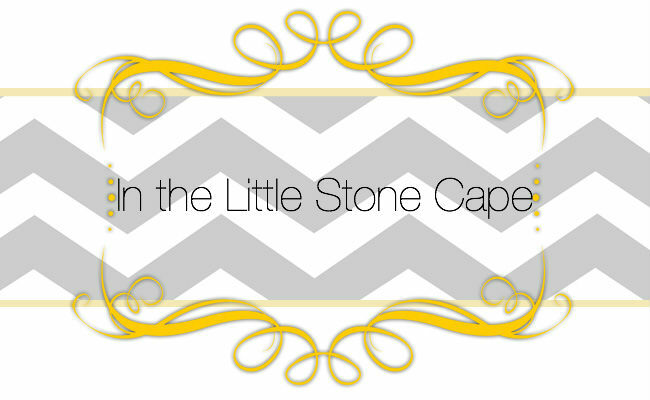 I personally used the resin snaps from the Babyville Boutique line since I already owned a snap press for this kind of snap. 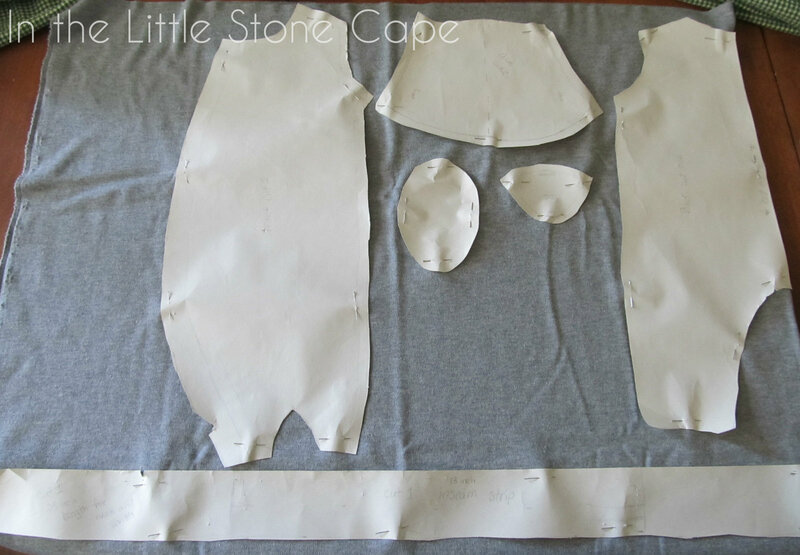 There is certainly a learning curve involved with any snap system so be sure to practice on a scrap piece and then carefully mark out where your snaps should go and whether they need to be male or female (I have included these placements on the pattern). 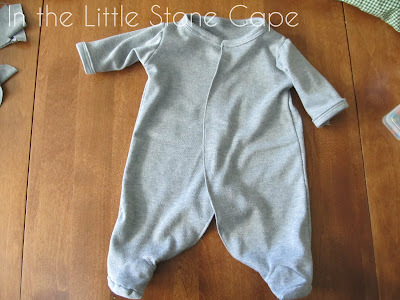 Now you have a completed pajama outfit ready for the new little baby in your life. Too bad they grow out of these so quickly! But all the same, how fun is it to sew for tiny little ones? I know my guy will be super comfy in this outfit. I can't wait to see him in it! I love this tutorial! It's step by step and very clear to me. I will try to make one by your pattern with some adjustment (since I am going to make a summer PJ with different material for my 5mo son) Thank you! I tried to make my own sleeper pattern and managed to do so successfully, but it was SO much work ... I think I'll try yours now and save myself some angst! really nice pattern, it looks better and more practical then all the commercial patterns I've seen, and I've been searching alot. So thank you very much for sharing it! I'll sew one right now. I think this is size newborn, but it is much better than the Brindle and Twig one, which comes out huge. 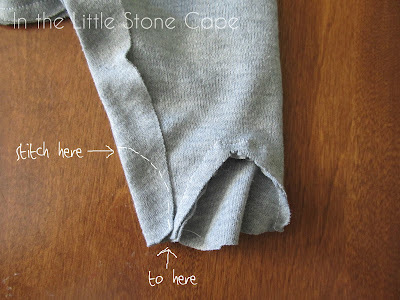 How do hem the ront edge? With the strip, but how to sew it? 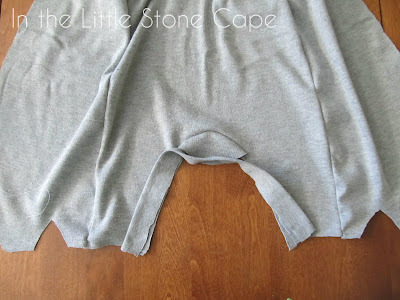 If you are referring to the edges of the front opening, they are not sewn with a strip of fabric. They are pressed down 3/4 inch and top stitched. You may wish to add a strip of stabilizer to support the snaps on the wrong side of the fabric before you fold and top stitch. But that is not shown in this tutorial. I am excited to try this!!! Thank you!!! !